Recipe from Holly Clegg, author of Too Hot in the Kitchen: Secrets To Sizzle At Any Age. This easy, tasty recipe gives a wonderful blend of sweet and salt to sweet potato wedges. 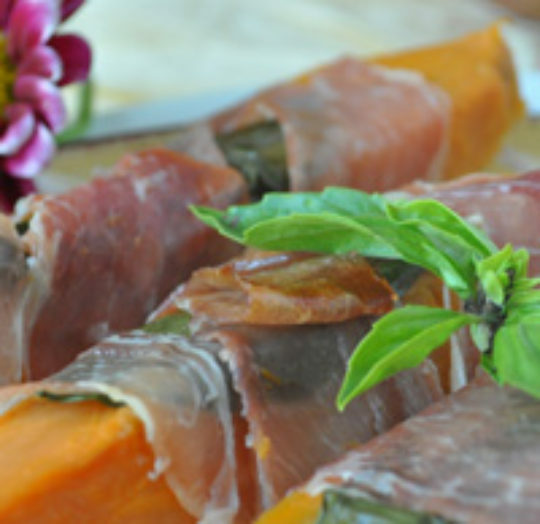 Fantastic prosciutto is wrapped around sweet potato wedges and baked until it’s crispy and mouth-watering. Mix with basil leaves to create a popular new treat. Add a kick to traditional potato wedges with this innovative flavor combination! Preheat oven 425 degrees. Coat oblong baking dish with nonstick cooking spray. Peel and cut sweet potatoes into wedges (four per potato). In large nonstick skillet, add water to cover sweet potatoes. Bring to boil, cook 8-10 minutes or only until potatoes are firm but cooked. Do not overcook as will fall apart. Drain. Lay basil leaf on potato wedge and wrap with prosciutto. Repeat with all sweet potato wedges. Lay in prepared baking dish. Drizzle with maple syrup, bake 10 minutes or until prosciutto starts to crisp.